Qool is manufactured and marketed in Australia. Sugar content: 26.8 grams (per 8.46 ounces). How Does Qool Energy Drink Compare? 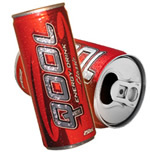 Qool Energy Drink contains 5.91 mgs of caffeine per fluid ounce (19.98mg/100 ml).